On 11th April 1912 the Cunard liner RMS Carpathia departed from New York bound for the Mediterranean with 750 passengers on board, one third of her total capacity. Her Wireless Operator was 21 year old Harold Cottam. When Jack Phillips sent the first CQD/SOS from RMS Titanic Harold Cottam was on the bridge of the Carpathia, on return to his wireless room he contacted Phillips and as a result the Carpathia raced to the position given by the Titanic. As a result the Carpathia saved the lives of 705 passengers and crew from the Titanic including the second Wireless Operator Harold Bride. The two then worked tirelessly sending the names of the survivors, and receiving messages. To mark the centenary of the Titanic disaster and the role of RMS Carpathia and Harold Cottam, the Radio Officers Association Radio Society have obtained a very special call sign. 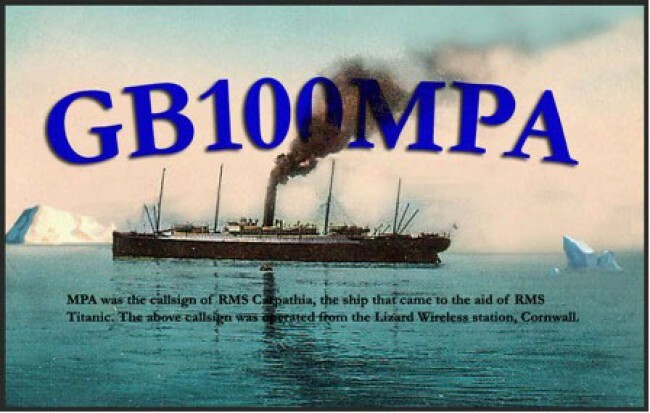 The call sign of the Carpathia was MPA and the Radio Officers Association will be operating GB100MPA during the month of April from their station based in the Lizard Marconi Wireless Station and Museum in Cornwall, England. The station will operate on the HF amateur bands using both CW and SSB. QSL will be through QRZ.com or strictly by return through the RSGB bureau or on receipt of an IRC and reply envelope via G3PLE who is QTHR (not through the bureau). The locator for the station is IN79 and WAB SW 71.